….Likewise I invite you to have respect for those people who have the right that they should be respected, from those between you and whom there is an agreement (of protection) [i.e. Non-Muslims]. For the land which you are living is such that there is an agreement between you and them. If this were not the case they would have killed you or expelled you. So preserve this agreement, and do not prove treacherous to it, since treachery is a sign of the hypocrites, and it is not from the way of the Believers. Do not be fooled by those sayings of the foolish people: those who say: ‘Those people are Non-Muslims, so their wealth is lawful for us [i.e. 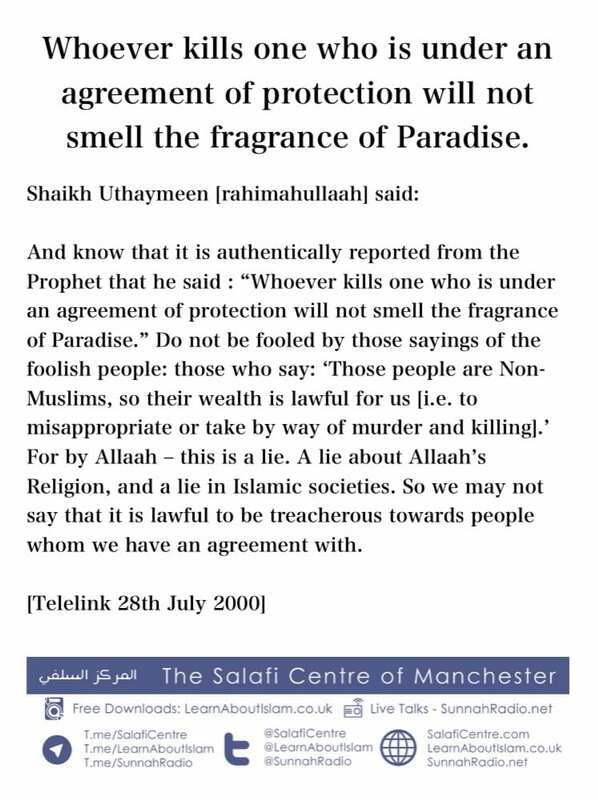 to misappropriate or take by way of murder and killing].’ For by Allaah – this is a lie. A lie about Allaah’s Religion, and a lie in Islamic societies. The Scholars have stated that forbidding evil with the hand is done by the governments and the authorities, so they hold and punish and imprison the evil doers. If they withhold from this duty, it does NOT fall into the hands of the citizens to take the law into their own hands. Rather they remain patient. As for speaking against the evil in terms of refuting the false ideologies, then that it for the scholars and the people of knowledge, not for ignorant, and there has never been a time in the history of Islam, except that the scholars have spoken out against evil ideologies and doctrines as a safeguard for Islam, and this will not stop up until the final Hour is established. As for the general person then he forbids only in accordance to his knowledge and ability in line with the rulings of the true scholars of the Sunnah based upon the Qur’aan and the Sunnah. As for hating with the heart, then this for the one who recognizes evil, but does not have the knowledge nor the ability to speak against this, so he distances himself from it and keeps away from it. Therefore, as it relates to the terrorists, then it is well-known that their evil and inhumane acts are condemned by the Muslim scholars based upon the texts of the Qur’aan and authentic Prophet narrations. So both, a Muslim student of knowledge and the general person is to inform the authorities of those that incite or plan terrorist acts. 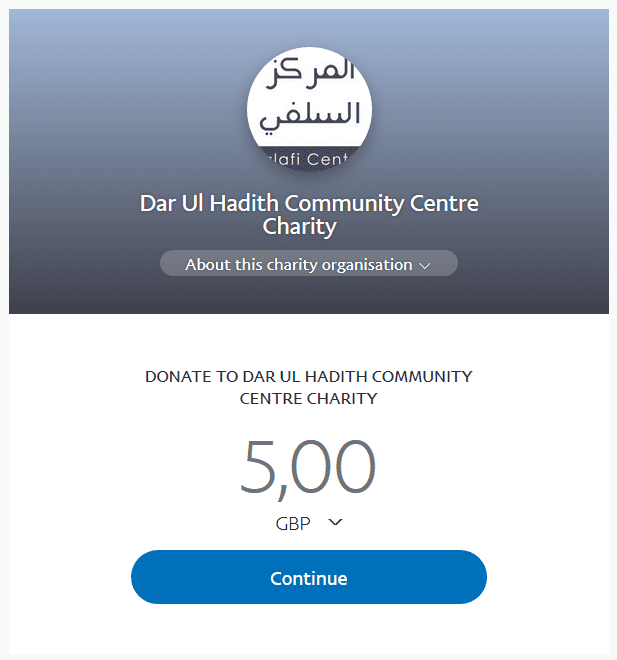 And this is from the aspect of forbidding evil and thereby earning the reward of Allaah [The Most High]. Another reason why these terrorists and their ideology must be stamped out is due to the fact that they are innovators who have attributed to Islaam, that which Islam is free of, and it is impermissible to accommodate them or defend them or protect them, due to the statement of the Prophet [salallaahu alaihi wassallam], ‘’Whoever innovates or accommodates an innovator, then upon him is the curse of Allaah, His Angels and the whole of mankind.’’ (Reported by Bukhaaree and Muslim). And there is not a shadow of a doubt from an Islamic perspective, that these terrorist ideologies are innovations and these perpetrators are innovators, and it is not permissible to protect them or give them refuge. One can recognize the ideology of the these evil doers from certain matters that their lectures and discussions always revolve around, from them is that they always call for rebellion and revolution in the Muslim lands and against the Muslim rulers; they declare the Muslim rulers and those who work in the apparatus of government to be apostates; they praise the suicide bombers and terrorists and insurgencies in Iraaq, Palestine and other places and continually justify their actions; they may praise the bombings of 9/11 in New York, 7th July bombings in London or the Madrid bombings. These discussions of theirs may not necessitate that they themselves will organize or carry out terrorist acts but this speech of theirs incites others towards violence. Remember it only takes two or three young men (or women) who have been affected to go out and wreak havoc. The Messenger of Allaah (salallaahu alaihi wassallam), mentioned these renegades (known as the Khawarij) in a narration, ‘’If I am alive when they appear, I will slaughter them with the slaughtering of Aad.’’ And Aad was a tribe mentioned in the Qur’aan that was punished by Allaah for their evils and transgressions. He also stated, ‘’They are the worst of Allaah’s creation under the sky.’’ There are many, many other narrations of the Prophet and his Companions describing them, to the extent that Shaikhul-Islaam Ibn Taymiyyah and Imaam an-Nawawee, two great scholars of the middle ages, stated the consensus of the great Scholars of the early generations of Islaam that these renegades must be prevented and fought against. So when one looks at the activities of these people such as the killing of men, women and children, Muslim and non-Muslim alike, one sees that they are indiscriminate in their murderous acts. After what has been mentioned above one can see why the Scholars of Salafiyyah have issued verdicts calling people to inform the authorities if they know of anyone inciting or planning terrorist acts. There is NO doubt that those make a link between terrorism and what they term as ‘’The Wahhaabis’’, intending by that the Salafis, have made a mythical link based upon fallacies and falsehood. The great Scholar Muhammad Ibn Abdul-Wahhaab (died 1206AH), after whom his adversaries invented the derogatory term ‘Wahhaabi’ for anyone who studied his works – then this Scholar was the most fervent in his opposition to deviation and deviant ideologies. Rather the Salafis, whom the opposers term as Wahhaabis, have been at the forefront of combating the takfeeri, Jihaadi and Terrorist ideologies, for decades. And this refutation of the Salafi scholars against these groups was not just a mere response to modern-day events but rather a religious obligation upon them regardless of prevailing circumstances. So Syed Qutb, the father and reference point of the modern-day Jihadist-terrorist movements, was refuted by the Salafi Scholars for his call to assassinations and violent revolution decades ago and again in the early nineties by the likes of the Salafi scholars such as Shaikh Bin Baaz, Shaikh Bin Uthaimeen and especially in great detail by Shaikh Rabee bin Haadee al-Madkhalee who authored several books in exposition of Syed Qutb. Shaikh Bin Baaz warned and exposed the evil doctrine of Usamah bin Laden back in the early nineties, whilst the Islamic political groups were in praise of him. Sayyid Abul Ala Maududi is another reference point for the modern day violent politically motivated groups, yet the Salafi Scholars such as Shaikh Rabee al-Madkhali, Shaikh Ubaid al-Jaabiree, Shaikh Hammaad al-Ansaaree exposed his errors and warned against his approach. Another example is the warning of the Salafi Yemeni Scholar Muqbil bin Haadee against the HAMAS of Palestine whilst the latter were supporting terrorist attacks on civilian buses in Israel. We also have the Scholarly Salafi stance against Hizbollah of south Lebanon and former leader of Iran, Khomeini such as the statements of Shaikh Bin Baz, Shaikh Bin Uthaimin, Shaikh Ahmad an-Najmi and others. Shaikh Ibn Uthaimeen in his now published explanation of ‘Riyaadhus-Saaliheen’ well over fifteen years ago showed his clear abhorrence at the suicide bombings in Palestine. So this is the clarity with which the Salafis speak and have always spoken. Over a thousand years of Salafi authorship, from the time of the disciples of the Prophet until this day, the Scholars of Sunnah and Salafiyyah have been refuting the false ideologies, whether extremist or negligent – Whereas the people of deviation will respond based upon political expediency, but the underlying ideology in support of revolution and suicide attacks remains.